It’s a Great Year for 4-H Calendar Art! The National 4-H History Preservation team is delighted to announce that already this year not one or two, but three pieces of original calendar art were found by 4-H Staff. 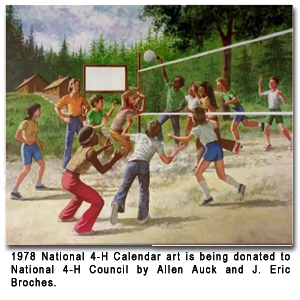 In the seven years since we started working to preserve national 4-H history, only one other National Calendar painting outside of the 4-H Center had been discovered, purchased and presented to the National 4-H Council for the permanent collection. You Can be a Calendar Art Detective and join these two to help “bring back the 4-H Art. Please be on the lookout for published calendars and original art to help document this rich visual history of 4-H. Some of the best places to look are antique shows and malls, internet art sales and even flea markets and farm sales. We are not only looking for the original art but also copies of any and all published 4-H calendars. 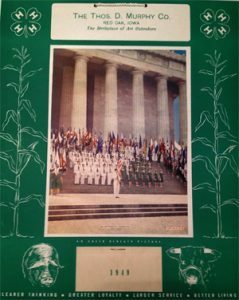 The national 4-H calendar program was originally authorized in 1937 but the first calendars that we have seen are from 1942. The last known 4-H calendar produced by a company is from 1991. We would like to have an image of every calendar printed between 1939 and 1991. All three of the “new” art pieces were painted by James E. Seward for the Shaw-Barton Calendar Company of Coshocton, Ohio. 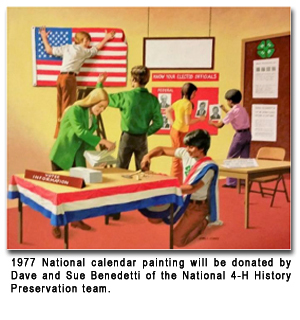 At this time, we believe that he created at least 18 National 4-H Calendar paintings beginning with the 1970 calendar and going up through 1987 and possibly longer. Seward also was one of 100 artists from around the country picked for the National Arts in the Parks Competition. He was also commissioned for portraitures by many organizations. His paintings grace the walls of such companies as the General Motors Corporation, the Wells Fargo Bank, The McDonald Investment Company, and the Will Rogers Museum in Oklahoma. Remember, we’re looking for both original art and printed calendars to fill in the blank spaces in the archives of the National 4-H Calendar program. The calendar itself, a photograph or a scan of any calendar with the 4-H Clover on it will help us document what calendar company produced it and what year it was released. For some paintings we are missing records of the year or title or the name of the artist. Having a copy of the printed calendar itself would give us that information. 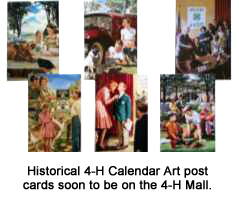 Right now we have two pieces of original art and six photographs of 4-H calendar art but we don’t know the year, the title of the image or – in some cases – which calendar company produced them. 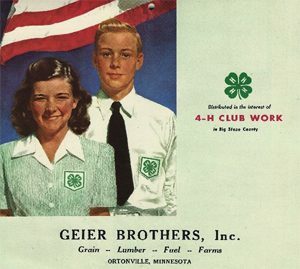 National 4-H posters were popular visibility tools in 4-H for decades. 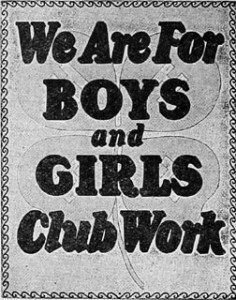 The first national poster was created as a sales item by the National Committee on Boys’ and Girls’ Club Work in 1924, a year before the National 4-H Supply Service was even launched. 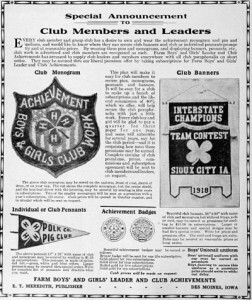 It showed a large 4-H clover emblem with the words, “We are for Boys’ and Girls’ Club Work.” It was suggested by Gertrude Warren, 4-H/Extension Service, USDA. Throughout the rest of the decade of the 1920s, the National Committee on Boys’ and Girls’ Club Work produced annual posters which were distributed throughout the Extension System and to donors, and then offered for sale through the Supply Service. The last of this series apparently was the poster issued in 1931. Due to the Depression, no new posters were issued until after World War II. 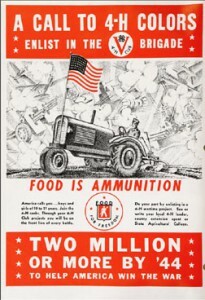 There were, however, a couple of wartime 4-H posters produced and offered through the National 4-H Supply Service. In 1946, Coats & Clark Inc. (J. 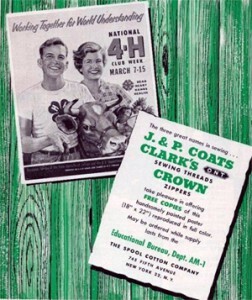 & P. Coats and Clark), which had been sponsoring the National 4-H Clothing Awards Program since 1941, began sponsoring the National 4-H Poster Program, too. 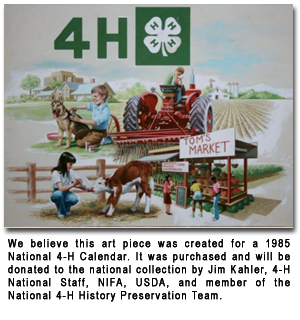 Working with the 4-H Office, Extension, USDA and National 4-H Service Committee’s information staff, Coats & Clark annually produced and distributed (for free) the national 4-H poster; later, they also provided the poster design as a colored slide. 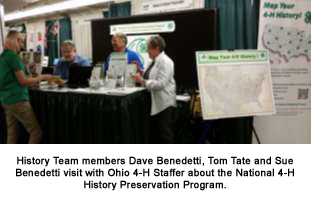 The poster distribution was geared to having the posters distributed in time for use during National 4-H Week. 4-H office, not from Coats & Clark. Many of the annual poster artwork pieces were painted by the famous artist, William C. Griffith, who also was the artist for about 15 of the historic 4-H calendar art pieces. 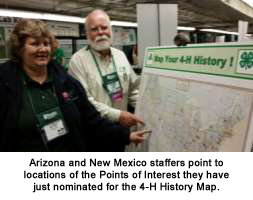 According to Sue Benedetti, then 4-H Extension, USDA, who coordinated the program in the early 1970s, more than 1,350 original posters were submitted by 4-H members, as well as clubs, in the first year of the program. The posters were judged by delegates to National 4-H Conference during sessions on 4-H image. In 1971, a change in the program made it possible for posters to be judged at local, county and state levels with a highly selective group being sent to Washington for final national judging. By the mid-1970s, delegates to National 4-H Congress were asked to suggest theme areas for 1976 posters. An article in the Fall 1978 issue of National 4-H Council Quarterly reports that the 4-H Poster Art Program continues to grow – that a recent survey conducted by National 4-H Council showed that 47 states were participating in the program, accounting for over 130,000 4-H members submitting posters that could eventually become the design for the national 4-H poster. The only poster missing is the one pictured below in this advertisement in the February 1953 National 4-H News. If you have seen or own a copy of this poster we would appreciate hearing from you at Info@4-HHistoryPreservation.com We are eager to complete this national collection and the historical records. The artist used real people as models, and in this case it was a real County Agent named Herald K. Rippey who served as agent in Jay County, Indiana. Clint Hoover, director of the Nebraska Center Hotel, spotted Mr. and Mrs. Rippey, one summer day, standing in the lobby in front of the painting. Enroute home from a West Coast vacation, they stopped to see the painting in its permanent home at University of Nebraska/Lincoln. Rippey reminisced about 4-H and his brush with fame with Norman Rockwell. Purdue’s School of Agriculture had picked Herald Rippey as the county agent and Rippey selected the Don Steeds, an active 4-H family of Portland, Indiana, as subjects. When Mr. and Mrs. Rockwell arrived in Indiana, he was well pleased with the plans for the setting except for the barn – it was white and he wanted a red one. Although he planned for a spring scene on the canvas, preparations were actually done in the fall. Faithful to detail, Rockwell changed the boy’s winter cap to the proper spring attire. And after Rockwell’s farmer neighbor reminded him that all calves have heavier coats than spring calves, Rockwell repainted the calf. 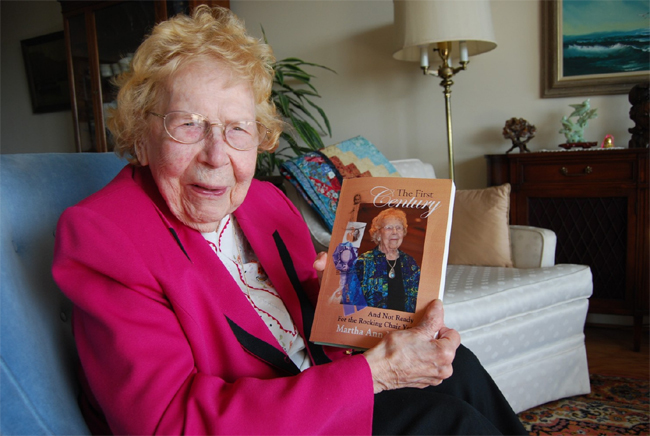 In 2010, Gama Fuller, the model for the 14 year old 4-H girl in the painting, recalled the experience in an interview with Portland, Indiana’s The Commercial Review. Gama, now 73, a resident of Redkey, Indiana, and her sister, Sharon Smith (also a former 4-H’er), are the only two surviving models portrayed in the painting. Gama’s brother, Larry Steed, is in the painting, as is County Agent Herald Rippey and hired hand Arlie Champ. All three Steed children were active in 4-H, members of the Jefferson Livewires 4-H Club. The original painting is now housed in the lobby of the Nebraska Center for Continuing Education at the University of Nebraska/Lincoln. Two hundred full color collotype proof prints were made and 60 were signed in pencil by Norman Rockwell. The National 4-H Youth Conference Center in Chevy Chase, Maryland, has a numbered signed print, a special gift to the Center. Did you know that there is a rustic garden at the National 4-H Youth Conference Center where small groups can hold a quiet meeting or closing ceremony? 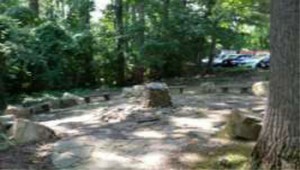 The “Daddy Jenks” Meditation Area was dedicated on Audust 30, 1959 by the Maryland Chapter, 4-H Club All Stars. The area is known by many names: Jenkins’ Park, Jenkins’ Nature Area, Jenks Garden or Daddy Jenks Woods. The name doesn’t matter. The stone walk leading from the back parking lot at the 4-H Center is short… a matter of just a few steps, but places you in the midst of tall trees and solitude, a wonderful place to come and clear your mind on a hectic day. Edward Garfield “Daddy Jenks” Jenkins was born on June 18, 1873 in Prompton, PA. As a young boy, he gave himself his middle name of Garfield after his favorite President. As a man, he was given the Indian name meaning “a little man with a big, tender heart.” “Daddy Jenks” was called to Washington during World War I to be the Asst. Director of the Boys Working Reserve in the Labor Department. He went all over the country mobilizing young people to help on farms, producing food and fiber for war production. 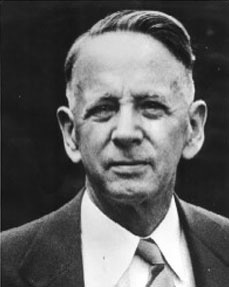 In 1919 he became the Maryland Boys’ 4-H Club Leader, where he remained until his retirement in 1943. 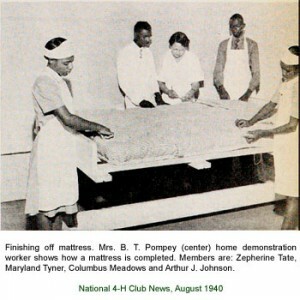 Jenkins, Mylo Downey and Dorothy Emerson (past Maryland 4-H State Leaders) are acknowledged as the foundation for the Maryland 4-H Program. “Daddy Jenks” worked closely with William Kendrick, West Virginia State Boys’ Club Agent who had started a chapter of 4-H All Stars. 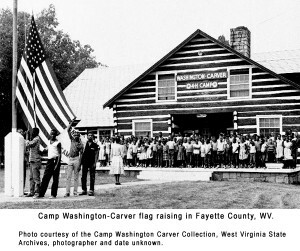 Jenkins invited West Virginia 4-H All Stars to establish the Maryland chapter in 1921 with 12 charter members. He commented: “I have always felt the outstanding 4-H All Stars are those who are endowed with the power of love, consecration, patience, and deeper understanding.” Today, several thousand active All Stars work in service to 4-H across the state. The Maryland 4-H All Stars presented a memorial garden at the National 4-H Center to recognize and honor this gentle man. “Daddy Jenks” left a remarkable legacy of service through his years of dedication and accomplishment.